In the year 2013, Our company, Metalcraft Engineering Pvt. Ltd., Established as a prime manufacturer of Commercial Kitchen Products. 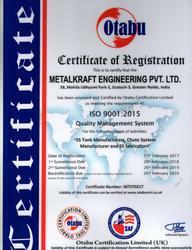 Our steady growth and high reputation within the industry is attributed to our unique line of products that includes Laundry Chute, Garbage Chute, Debris Chute, Stainless Steel Milk Tanks, Stainless Steel Pressure Vessels, Linen Chute, Stainless Steel Trolley, Stainless Steel Tank and many more. We maintain a strict policy of adhering to the client's requirements, which is why we provide custom solutions as per their specific needs. Our earnest efforts lie in providing our clients with undisputed ranges of products and services that are unique to our organization amongst all our industry contemporaries. We value our clients and believe in maintaining ethical business relations. We have established ourselves within a campus of architectural excellence. Our state of the art infrastructure comprises of structures designed to facilitate various departments to specifically characterize work on the basis of specialization. We work alongside professionals with vast industry experience and technical know-how along with high-tech machinery that aide in the process of impeccable manufacture. Our Efforts in maintaining top quality along with functionality has earned us clients of utmost repute including Nirulas, HCL, Punjab Technical University, National Security Guard, Yamaha, Symbiosis International University, Zee News and Star News. We yearn to introduce new clients into our circle of mutual growth and welcome them with a promise of deliverance. Guided by the vast industrial knowledge and experience of, Mr. Indrendu Roy, our director, we aim towards achieving unattainable heights. We yearn to ensure that his vision is met with utmost justice. With extreme hard work and dedication towards our clients, we envision ourselves reaching the pinnacle of success with a rapid rate of progress. We have earned a strong position in the business, in a short time span. Our customers place huge trust in our abilities and depend upon us for the attainment of their diversified requirements. At our end, we ensure that all the quality demands of our patrons are fulfilled at the topmost priority. With a huge number of clients, in a minor period from our inception, we have captured the markets with a huge impact. Our infrastructure stands above the industry in terms of spacing and storage facilities. We possess more than 10,000 Sq. ft of an area within our organization. Our organization has been segregated into departments that utilize our resources to render an unmatched rate of production. Our machines are regular services and upgraded to increase accuracy and rate of production. We have an infallible warehousing unit that aids us in the storage and stocking of all our end products so that dispatch can be facilitated with ease. We pay exceptional attention to the upkeep of quality. Our Raw material is procured from the most trusted sources of vendors, who have maintained a high reputation within the industry. We use the most rigid and supreme quality steel in our products amongst other high-grade material so that longevity of the product is ensured. Our quality testing department ensures that each product is functional, robust and user-friendly so that our clients enjoy the easiest operation with least chances of faultiness. It is our solemn duty to provide our client with products free from damage or redundancies, which is why our packaging division ensures the safety of the components before shipping. We have maintained a steady rate of production with a high rate of satisfaction. During this time of our existence within the industry, we have seen a phenomenal rate of growth and successfully molded our working procedures accordingly. Our expansive base of clients combined with our exclusive range of products is evidence of our unfaltering success in supplying the demand. Our client-centric nature and humbled business dealings make us an ideal organization for continued associations. We work alongside a team of trained professionals who are adept in their particular fields of work. Our various department's house professionals that work round the clock to ensure continued productivity along with absolute customer satisfaction. We proudly associate ourselves with professionals including engineers, design experts and client servicing professionals amongst an array of skilled and semi-skilled employees. Together, we work in a systematic manner to produce our unmatched range of products that our clients can enjoy.